Collaborative robots are mechanisms that can be safely used next to people without the need for safety barriers, which are expensive, consume a great deal of bench/floor space, and obstruct access to equipment. All of the contact forces generated by this mechanism are limited so that the robot cannot hurt a user even if it collides with them at full speed, making it safe to operate side-by-side with personnel. All Precise collaborative robots have been measured and certified by TUV to exert forces that fall within the force guidelines for collaborative robots as defined by the recent ISO/TS 15066 Standard on Collaborative Robots. 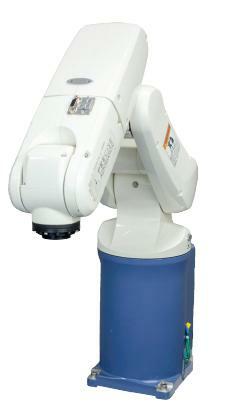 The PF400 is the world's first collaborative SCARA robot. This low-cost, quiet OEM mechanism has its motion controller, harnesses and power supplies embedded within its structure to eliminate extra enclosures and simplify installation. This space saving design, together with a novel geometry, allows the PF400 to service many stations in an extremely small workcell. Combined with absolute encoder servo motors, which do not require any motion to home during start-up, and the collaborative aspects of the robot, which eliminate the need for barriers, the PF400 significantly reduces the size and cost of an automated cell. The lightweight PF400 can be carried by one person, mounted on a table and, by plugging in just an AC power cord and an Ethernet cable, is ready to operate. 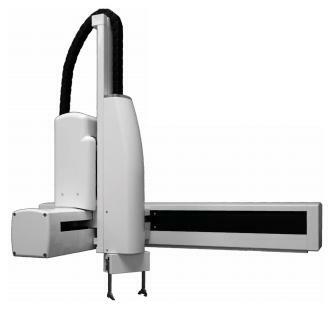 The lightweight PAVP6 6-axis robot can be carried by one person, mounted on a table and, by plugging in just an AC power cord and an Ethernet cable, is ready to operate. The PAVP6 is an ideal choice for automation in a mixed manufacturing environment. Due to its collaborative design, small footprint, embedded controller and absolute encoder servo motors (which do not require any movement at start-up), it can be easily integrated into a previously manual process. Interacting side by side with human counterparts, it can improve both the cost and workflow of existing applications. The PAVP6 provides many advanced features such as: kinematics for Cartesian control; gravity balanced free mode teaching that allows the robot to be taught by manually leading the end effector; and a vision interface for advanced sensing. Unlike many other collaborative robots that are inherently dangerous but operate in a collaborative mode, the PrecisePlace 100 Cartesian robot (PP100) is inherently safe and is designed to limit all collision forces all of the time. This permits users to safely access the robot’s active workspace while the robot is operating at full speed without requiring safety barriers. The lightweight PP100 comes out of the box fully assembled. All control electronics, harnesses and power supplies are built into the PP100's structure, which results in an extremely compact device that saves space and set-up time. This novel collaborative, space saving design combined with a low cost, reliable mechanism and efficient t-bot drive make the PP100 an ideal choice for applications where size, safety, cost, and the combined productivity of automation and personnel are critical.